Bengali nationalism is rooted in the expression of pride in the history and cultural, intellectual and revolutionary heritage of Bengal. 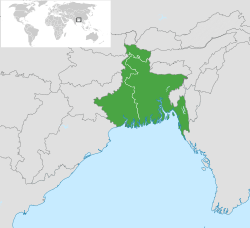 The region's territory is divided between Bangladesh and the Indian state of West Bengal and the southern part of the Indian state of Assam, called Barak Valley . 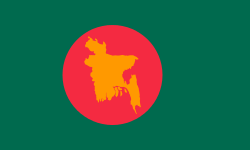 Arising in the 19th century with the Bengal Renaissance and the Indian independence movement, it would be the central influence in the Bengali Language Movement, the Bangladesh Liberation War and the creation of Bangladesh (Country of Bengal) in 1971. A map of Bengal, divided between east and west. Bengali nationalism is rooted in the expression of pride in the history and cultural heritage of Bengal. In what is described as the Bengal Renaissance, the introduction of Western culture, science and education led to a major transformation and development of Bengali society. Bengal became a centre of modern culture, intellectual and scientific activities, politics and education under British Raj. The first social and religious reform movements such as the Brahmo Samaj and Ramakrishna Mission arose in Bengal, as did national leaders and reformers such as Raja Ram Mohan Roy, Sri Aurobindo, Ramakrishna Paramhansa and Swami Vivekananda. Bengali literature, poetry, religion, science and philosophy underwent a massive expansion with the works of Bankim Chandra Chatterjee, Debendranath Tagore, Michael Madhusudan Dutt, Sharat Chandra Chattopadhyay, Rabindranath Tagore, Satyendra Nath Bose, Jagdish Chandra Bose and Kazi Nazrul Islam. The Young Bengal, and Jugantar movements and newspapers like Amrita Bazar Patrika led the intellectual development of India. The Calcutta-based Indian National Association and the British Indian Association were the earliest political organisations in India. The first Bengali nationalist agitation emerged over the 1905 Partition of Bengal by British authorities. Although the partition was supported by Bengali Muslims, a large majority of Bengalis protested the partition and participated in civil disobedience campaigns such as the Swadeshi movement and mass boycott of European goods. Seeking a united Bengal and rejecting British hegemony, Bengalis also spearheaded an emerging revolutionary movement, which assumed a central role in the national independence struggle. Bengal became a strong base of the Indian struggle for independence, giving rise to national political leaders such as Bipin Chandra Pal, Khwaja Salimullah, Chittaranjan Das, Maulana Azad, Subhas Chandra Bose, his brother Sarat Chandra Bose, Syama Prasad Mookerjee, A. K. Fazlul Huq, Huseyn Shaheed Suhrawardy — the latter two would become important leaders of the Pakistan movement. As the Hindu-Muslim conflict escalated and the demand for a separate Muslim state of Pakistan became popular amongst Indian Muslims, the partition of India on communal lines was deemed inevitable by mid-1947. To prevent the inclusion of Hindu-majority districts of Punjab and Bengal in a Muslim Pakistan, the Indian National Congress and the Hindu Mahasabha sought the partition of these provinces on communal lines. Bengali nationalists such as Sarat Chandra Bose, Huseyn Shaheed Suhrawardy, Kiran Shankar Roy, Abul Hashim, Satya Ranjan Bakshi and Mohammad Ali Chaudhury sought to counter partition proposals with the demand for a united and independent state of Bengal. Ideological visions for a "Greater Bengal" also included the regions of Assam and districts of Bihar. 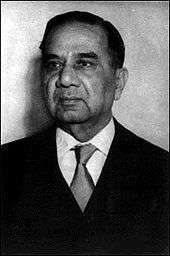 Suhrawardy and Bose sought the formation of a coalition government between Bengali Congress and the Bengal Provincial Muslim League. Proponents of the plan urged the masses to reject communal divisions and uphold the vision of a united Bengal. In a press conference held in Delhi on April 27, 1947 Suhrawardy presented his plan for a united and independent Bengal and Abul Hashim issued a similar statement in Calcutta on April 29. A few days later, Sarat Chandra Bose put forward his proposals for a "Sovereign Socialist Republic of Bengal." With the support of the British governor of the Bengal province, Frederick Burrows, Bengali leaders issued the formal proposal on May 20. The Muslim League and the Congress issued statements rejecting the notion of an independent Bengal on May 28 and June 1 respectively. The Hindu Mahasabha also agitated against the inclusion of Hindu-majority areas in a Muslim-majority Bengal, while Bengali Muslim leader Khawaja Nazimuddin and Maulana Akram Khan sought the exclusion of Hindu-majority areas to establish a homogenous Muslim Pakistan. Amidst aggravating Hindu-Muslim tensions, on June 3 British viceroy Lord Louis Mountbatten announced plans to partition India and consequently Punjab and Bengal on communal lines, burying the demand for an independent Bengal. In 1947, in line with the Partition of India, Bengal was partitioned between the Hindu majority west and Muslim majority East. East Bengal became part of the Islamic state of Pakistan while West Bengal became part of the Republic of India. February 22 rally after Janaja at Dhaka Medical College on Dhaka University road, Dhaka. The Language movement was a political and cultural agitation in East Pakistan that centred on the recognition of the Bengali language as an official language of Pakistan and a broader reaffirmation of the ethno-national consciousness of the Bengali people. Discontent against Pakistan's "Urdu-only" policy had spilled into mass agitation since 1948 and reached its climactic strength after police fired upon and killed student demonstrators on February 21, 1952. After the creation of Pakistan in 1947, the central government under Muhammad Ali Jinnah ordained Urdu to be the sole national language, even though the Bengali-speaking peoples formed a majority of the national population. He did so because Urdu was a neutral language - it was not the mother tongue of any one of Pakistan's ethnicities. The policy, compounded by sectional tensions served as a major provocation of political conflict. Despite protests in 1948, the policy was enshrined into law and reaffirmed by national leaders, including several Bengali politicians. Facing rising tensions, the government in East Pakistan outlawed public meetings and gatherings. Defying this, the students of Dhaka University and other political activists started a procession on February 21. Near the current Dhaka Medical College Hospital, police fired on the protesters and numerous protesters, including Abdus Salam, Rafiq Uddin Ahmed, Abul Barkat, and Abdul Jabbar were killed. The deaths of the students served to provoke widespread strikes and protests led mainly by Bengali political parties such as the Awami League (then Awami Muslim League). The central government relented, granting official status for Bengali. The Language movement served as a catalyst for the assertion of the Bengali cultural and national identity within Pakistan. The Language movement and its fallout had created substantial cultural and political animosity between the two wings of Pakistan. Despite constituting a majority of the Pakistani population, Bengalis constituted a small part of Pakistan's military, police and civil services. Ethnic and socio economic discrimination against Bengali people aggravated and agitations arose in East Pakistan over sectional bias, neglect and insufficient allocation of resources and national wealth. Steeped in Perso-Arabic culture, West Pakistanis saw Bengali culture as too closely associated with Hindu culture. One of the first groups demanding the independence of East Pakistan was the Swadhin Bangal Biplobi Parishad (Free Bengal Revolutionary Council). Under Sheikh Mujibur Rahman, the Awami League became more secular in character, changing its name from Awami Muslim League to just Awami League. and launched the Six point movement demanding substantial political, administrative and economic autonomy for East Pakistan. Seeking democracy, a separate currency and balanced sharing of wealth and resources, Mujib also sought the recognition of the term "Bangla-desh" to describe the eastern wing of Pakistan, instead of East Pakistan, thus emphasising the Bengali Identity of the people of East Pakistan. Mujib was arrested by Pakistani forces in 1966 and tried for treason in what became the Agartala Conspiracy Case. Following violent protests and disorder, Mujib was released in 1968. In the elections of 1970, the Awami League won an outright majority in the Parliament of Pakistan. When Pakistan's president Yahya Khan and West Pakistani politician Zulfikar Ali Bhutto resisted Mujib's claim to form the government, sectional hostility escalated significantly. Before his arrest on the night of March 25, 1971, Mujib issued a call for Bengalis to fight for their independence; the message was conveyed over Shadhin Bangla Betar Kendro by Major Ziaur Rahman on March 27 and the independent state of Bangladesh was officially declared by the Awami League's government-in-exile in Mujibnagar. Mujib's trademark "Joy Bangla" (Victory to Bengal) salute became the rallying cry of Bengali nationalists, who mobilised to form the Mukti Bahini guerrilla force, which received training and equipment from the Indian government. Indian intervention at the height of the liberation war would eventually lead to the surrender of Pakistani forces and the establishment of the Bangladeshi state on December 16. Mahua Sarkar, Visible Histories, Disappearing Women: Producing Muslim Womanhood in Late Colonial Bengal, (2008) Durham, NC: Duke University Press. Copf, David (2012). "Bengal Renaissance". In Islam, Sirajul; Jamal, Ahmed A. Banglapedia: National Encyclopedia of Bangladesh (Second ed.). Asiatic Society of Bangladesh. Misra, Chitta Ranjan (2012). "United Independent Bengal Movement". In Islam, Sirajul; Jamal, Ahmed A. Banglapedia: National Encyclopedia of Bangladesh (Second ed.). Asiatic Society of Bangladesh. Sheren, Syeda Momtaz (2012). "War of Liberation, The". In Islam, Sirajul; Jamal, Ahmed A. Banglapedia: National Encyclopedia of Bangladesh (Second ed.). Asiatic Society of Bangladesh.